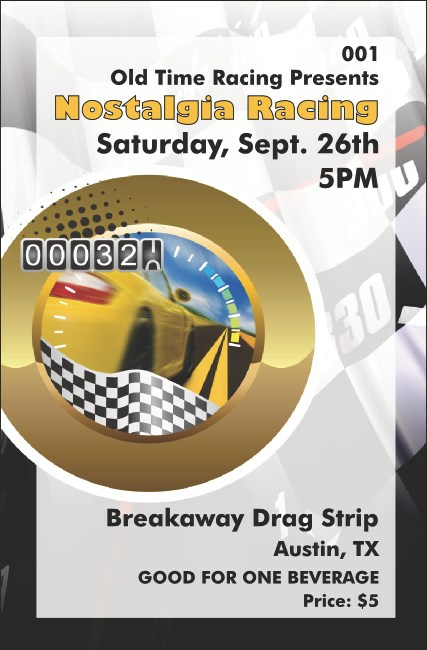 Start your engines and get ready to race! Whether you’re planning a big NASCAR bash or trying to fill the needs of a motor speedway, the colorful Stock Car Drink Tickets are the perfect way to put refreshments into the hands of your patrons! Individually numbered and featuring the photorealistic image of a stock car, this drink ticket is the perfect choice. Fill the speedway with fans with help from TicketPrinting.com!